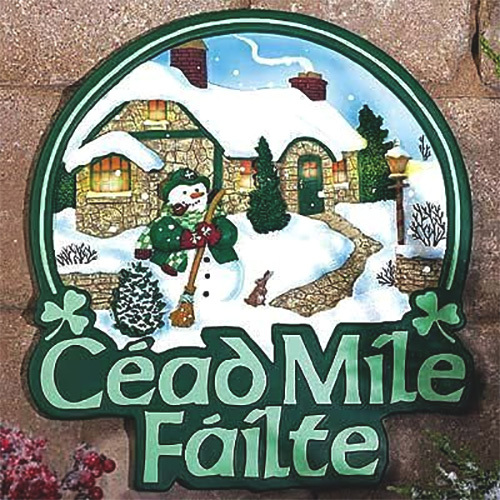 This Irish blessing plaque features Céad Mile Fáilte along with an Christmas motif. This Irish blessing plaque offers the Gaelic greeting of a hundred thousand welcomes. This Irish blessing plaque features the Gaelic welcome of Céad Mile Fáilte along with a colorful dimensional design that includes shamrocks. The Irish Christmas blessing plaque is made of resin and measures 10 3/4" wide x 11 3/4" tall and it is ready to hang on your wall. This Irish welcome plaque is gift boxed with a shamrock history card that is complements of The Irish Gift House.